People in the Upham area are poring over environmental impact assessments documents released this week on a gypsum mine proposal for the rural community. The proposal by Hammond River Holdings, a J.D. Irving Ltd. company, would see an open-pit gypsum mine set up on a 60-hectare (148 acres) property on Route 111 that, at its closest point, is about 100 metres from the Hammond River. 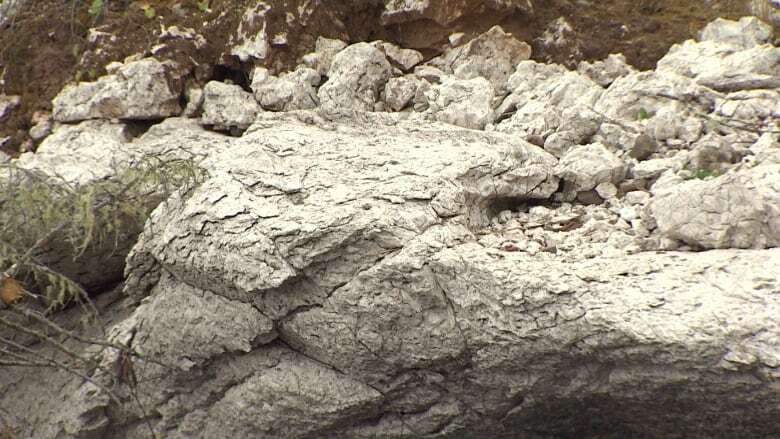 According to the documents, the gypsum rock will be extracted by blasting and then crushed on site with 35 to 40 transport trucks per day carrying the rock to Saint John via routes 111 and 865 to Norton and then Route 1. Runoff water from the site would be directed to either a settling pond or a sump pit at the bottom of the mine and then to two streams flowing to the river after suspended sediments have settled. The Hammond River is a known salmon stream. Resident Cheryl Johnson has spent a lot of time studying the documents. "I like how they are very open and honest with what they are proposing," she said. "It's like there will be runoff into the river, there will be loud noises that the residents will hear, there will be noticeable dust, but it will be of no significant concern." The document outlines measures to be taken to reduce risks of contamination to the air and to waterways, to minimize the impact on the larger community by having no blasting on weekends, and limit other activity to 12 hours a day. Johnson said she worries provincial government officials reviewing the project will have little appreciation for concerns of people living in the community. "Since we are so rural we don't have a town council, we don't have a mayor, we don't have zoning issues. We don't have another line of defence between the residents and this large corporation wanting to come in," she said. Sarah Blenis created a Facebook page to raise awareness about the planned project. She said her biggest concern after reviewing the documents is for the river. 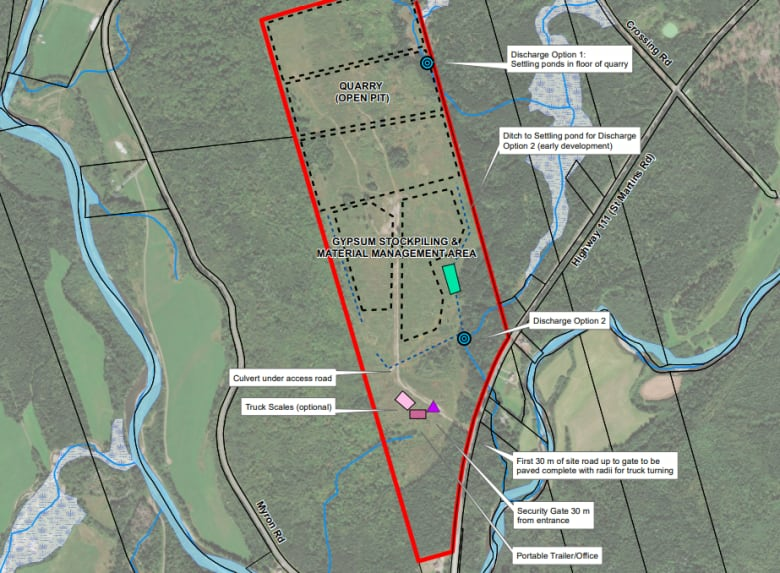 Blenis said 13 wetland areas and four watercourses are identified on the Irving property, which would eventually be largely taken up by the pit itself, or by materials management and gypsum stockpiling areas. 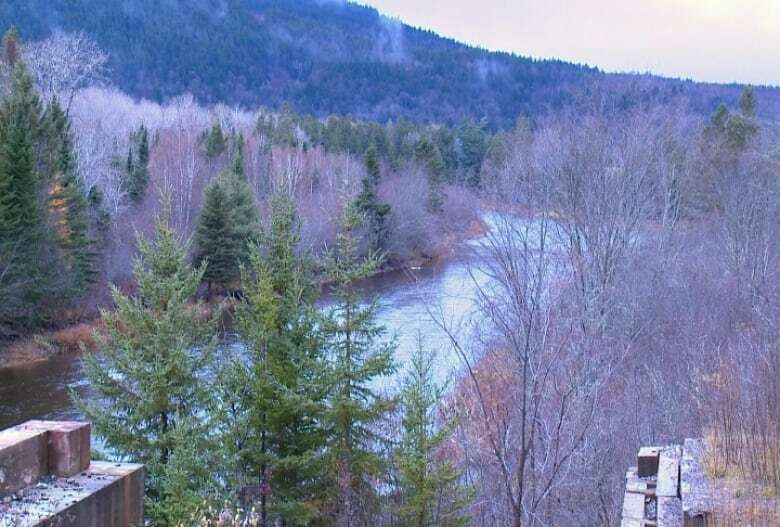 She said she wonders about the impact of heavy rain events, like the 60 millimetres received in southern New Brunswick last Friday and Saturday. "Sedimentation and runoff from this project will have a negative impact on the Hammond River and its ecosystem," said Blenis. 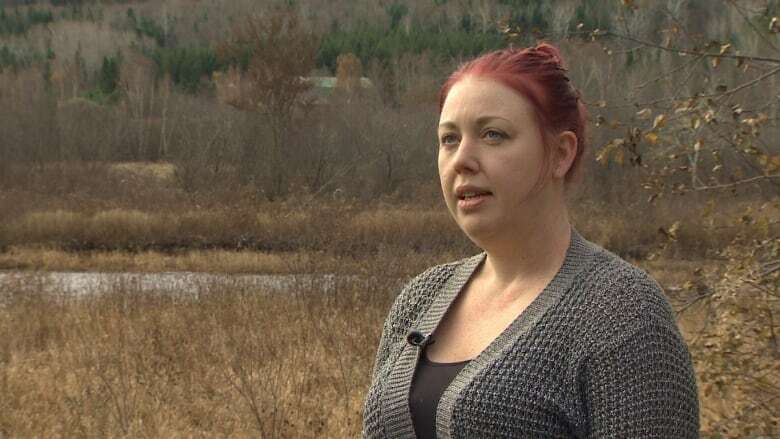 In response to questions submitted by CBC News, JDI spokesperson Mary Keith said allowable limits for suspended solids in the water will be set by the Department of Environment and Local Government should the project go ahead. If those levels are exceeded, work at the site will stop and the water held until levels return to allowable limits. She said the suspended solids in the water would be earth and remnants of gypsum rock, which is inert. She said there are no plans to develop other sites in the area where test drilling has taken place. According to the environmental impact assessment documents, construction would begin in the spring of next year with gypsum operations starting by late 2019. The company plans to visit residents within a two-kilometre radius of the mine for what are described as informal "kitchen table-style" discussions. One open house is also planned. The documents can be found on the Government of New Brunswick website.